Have you also noted that as the stock price tanked and buy-out or layoff plans increased, these companies are larding up executive ranks? MNI, for example, now has six regional vice presidents hauling in salaries in the $500,000range. I say range, because they are no longer reporting vice president salaries in their proxy reports. Back when they were a year ago, the salaries, bonuses and stock gifts were almost touching $600,000. GCI recently reorganized and has four instead of five vice presidents. What is worse, they seem to be burying the costs for this inflation of the front office by taking the salaries off the top of newspaper profits, rather than the category of administrative expenses, so they can report to stock owners the costs of the front office are not increasing. Another trend seems to be promoting human resources execs to vice president ranks. The inflation in top office ranks is as bad as the Pentagon, with associate assistant to the assistant secretary ranks, and it is difficult to see what these regional vice presidents do. It does fill up meeting rooms when execs gather to discuss what they are going to do to get their stocks back up. Just a note on your time frame: Knight Ridder's stock popped substantially in the years after the dot-com bubble deflated as investors/speculators craved profitable companies to throw their money at. KR issued stock options to all its employees priced at $54, if I recall correctly ... the stock rose into the 80s before crashing and triggering the sell-off. 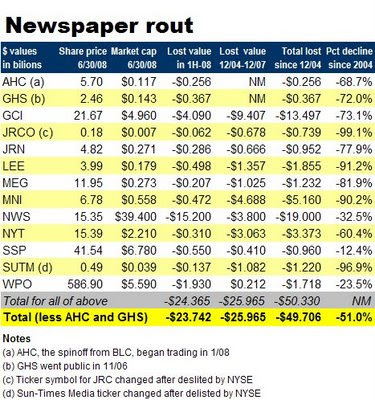 Point being most newspaper stocks were probably highly inflated in 2004, which would skew your numbers a bit. It is like watching a car wreck. I've left dead trees behind entirely in my day to day work, but I have contact through a couple contracts, lots of friendships from my days at Gannett and Landmark, and membership in the National Conference of Editorial Writers where it seems members are retiring or being shown the door faster than I can keep track. I keep waiting to see some sign that the death spiral is ending, but I don't even see a leveling off . The three that have performed the best in the group all have diversification well outside of local media. NewsCorp is obviously well diversified, WaPo has Kaplan, and Scripps has the cable networks. The industry looks more and more like the typewriter industry when computers came along... the only members in the industry that get any respect are those that have something else to offer. The Pulitzer's look to be just about the smartest people on the planet having jumped off the sinking ship into a lifeboat taking nearly $1.5 billion with them. That is timing the market my friends. Would bankruptcy be such a bad thing? Sure it would hurt small shareholders, but it might also clear out the front offices of clueless and troglodyte execs, and reduce boardroom overhead dramatically. This week, the Minneapolis Star-Tribune joined the Philadelphia Inquirer in deadbeat ranks by defaulting on some of its loans, and you point out that Journal-Register and Sun-Times are nearing that point. Media News cannot be far off, and both TRB and MNI look extremely precarious to me. So Rupert Murdoch gets to pick his choice of U.S. newspapers for firesale prices at bankruptcy sales. I seem to recall the Graham family's grandfather bought the Washington Post at a bankruptcy sale, and then became the dominant paper by buying the bankrupt Washington Times-Herald. The WaPo obviously made out fabulously in the process. Maybe a good shakeout is what is needed because, Lord knows, what they are doing now just plain ain't working.